The organizers of a wolf- and coyote-killing contest scheduled for next week near Salmon say one of their goals is to raise awareness about hydatid disease, caused by a tapeworm whose lifecycle involves infestation in wild canids and ungulates such as elk and which can infect humans. According to a paper posted on the Idaho Department of Fish and Game’s website by State Veterinarian Mark Drew, the echinococcosis granulosus tapeworm has existed in domestic sheep in Idaho since at least the 1960s, but was first discovered in wild game animals in the state in 2006 when two cysts were found in the lungs of a mountain goat killed near Atlanta. Since then, hydatid cysts have been found in the lungs of numerous deer and elk from central Idaho. The paper states that 62 percent of wolf carcasses examined between 2006 and 2008 were found to be infected with the parasite. The website of Idaho for Wildlife, a statewide hunters organization hosting the predator-killing contest, states that it has recently sent five wolf carcasses from the Salmon area to Colorado State University to have them tested for the presence of E. granulosus infection, and all tested positive. 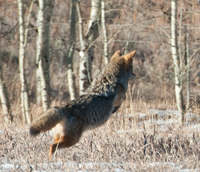 “High incidents of the parasite in wolves and coyotes and a high infestation rate with cysts in lungs and liver of deer and elk, put at risk the ranching, farming and rural communities,” states biologist Val Geist in a post on the Idaho for Wildlife website. According to the Idaho Department of Fish and Game’s website, if a human ingests E. granulosus eggs, which can be in the feces of an infected wild canid or a dog, they can hatch into larvae and form a cyst, generally in the lung or liver. According to the Centers for Disease Control and Prevention, the cysts often remain benign for years, but can grow large enough to cause discomfort, and a ruptured cyst can be fatal. However, Idaho State Epidemiologist Dr. Christine Hahn said a “call for cases” to infectious-disease doctors and the general medical community throughout the state in 2011 failed to identify cases of hydatid disease related to wolf exposure. She said all patients in Idaho were probably exposed to the disease in other places. Drew recommends against feeding uncooked elk and deer meat to dogs because the ingestion of the immature forms of E. granulosus could lead to the development of adult tapeworms in the dogs. The infected dogs can then expose humans to tapeworm eggs in dog feces. Wear latex or rubber gloves when field dressing and skinning game. Thoroughly cook wild game meat. Do not touch or disturb dead animals or carnivore feces. Do not let pet dogs eat organs or scraps from hunter-harvested or road-killed animals. Practice good hygiene—washing hands and washing contaminated clothes, especially after handling animals or feces. Carter Niemeyer, Idaho wolf recovery coordinator for the U.S. Fish and Wildlife Service, said he wears gloves when he handles live or dead animals, but he is not more concerned about hydatid disease than he is about many other possible causes of infections. Mark Johnson, project veterinarian for the wolf reintroduction to Idaho and Yellowstone National Park in 1995, stated in a letter to the Montana Legislature in 2010 that it is “extremely unlikely” that any introduced wolf carried E. granulosus into the U.S. from Canada, since each animal was treated at least twice by a parasiticide that is 100 percent effective in removing tapeworms. “Reducing wolf numbers will not reduce the prevalence of the tapeworm which is carried by the ungulates and is not dependent on wolf densities,” he added. Shane McAfee, president of Idaho for Wildlife’s Salmon chapter, said contestants will be lucky to kill a total of one or two wolves. “It’s not going to be a slaughter,” he said.